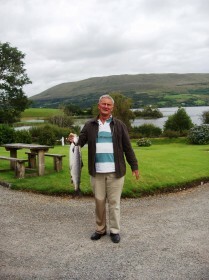 The West of Ireland has some excellent salmon waters with sea-trout present in many loughs and rivers. Ireland’s temperate climate produces a protracted season with opening dates as early as January 1 and generally closing on September 30. Fishing during the early part of the season to mid-March can be slow and unpredictable and very dependent upon water levels. Only a selective few fisheries, such as Delphi, the Moy and the Galway Salmon Fishery, produce fish at this time. Mid-March to mid-May sees the bulk of the Spring salmon catch and these fish average 12lbs., with some fish up to 25-30lbs. From mid-May, large numbers of grilse (one sea-winter salmon) appear in virtually all of the rivers and lakes with the exception of Loughs Mask and Carra. These fish range in size from 2-9lbs. averaging 5lbs. Towards the end of the season, in September, several systems receive runs of ‘Harvest fish’ which are in the 8-12lbs bracket, with the occasional fish of 15-20lbs. taken. River Moy and Lough Conn, Delphi and Erriff, Dawros and Kylemore lakes, Ballynahinch and Lough Inagh, Costello, the river Corrib at Galway and Lough Corrib. A State salmon/sea-trout licence is required and can be purchased at any of the fisheries, online and at other local outlets, e.g. tackle shops. Most of the rivers, and some lakes, are privately owned and costs range from €40/rod/day upwards. Gillies (guides), where available cost from €100/day. It is also customary to supply a lunch for the guide. Most fly fishing is with a floating line and small flies (sizes 8-12). Very heavy tackle and rods are not considered to be a necessity. A 13′-15′ double-handed rod is desirable as this enables Spey or roll casting where bank conditions are difficult. 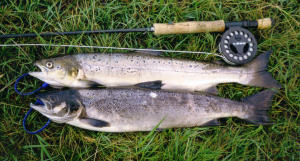 It is not absolutely necessary to have a double-handed rod, particularly during low water conditions, a 10′-11′ single-handed grilse/sea-trout rod would be perfectly adequate. Lines are normally 7-10 floating or intermediate, though a slow-medium sinking line is useful during spates, Spring fishing and late in September. All lines should have at least 75 yards of backing. Flies for Spring and late September include small tubes, Waddingtons 1″-1.75″, Shrimp flies and Hairwings (sizes 6-10). For Summer fishing, smaller Shrimp flies and Hairwings (sizes 8-12) are appropriate. Munroe Killer (Dark and Light), Thunder and Lightning, Blue Charm, Hairy Mary, Dunkeld, Moy Garry, Goshawk, Wye Bug, Willie Gunn, Garry Dog, Logie. Curry’s Red, Orange and Gold, Wilkinson, Foxford, Claret, Ally’s Yellow. Rods of 9′-11′ are used with the larger rods being used for Spring fishing and the smaller rods for light Summer fishing. Lines should be of 10-15lbs. with a good capacity reel. Mepps 4 or 5 Tobys 10 or 12gm. An 11′-14′ rod is desirable in order to give better line control for float fishing techniques. A rolling ledger or sliding float method is mostly used. The line should be of 10-12lbs. breaking strain with a heavier line for Spring fish and a spare spool of high visibility line is also useful. Anglers should note that prawning is not permitted on certain waters and the times and locations where it may be used could be limited.